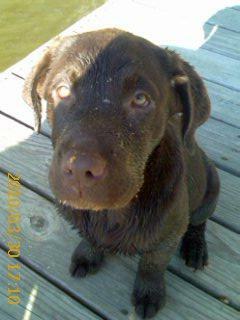 GRACIE WAS IN A LITTER OF 12 PUPS. HER OWNER WORKED CONSTRUCTION AND WAS AWAY FROM HOME MOST OF THE TIME. 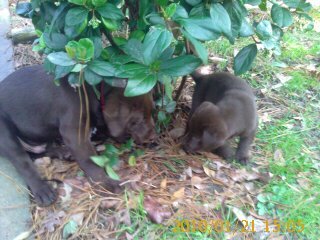 WE WENT TO SEE PUPS TO FIND A MATE FOR OUR CHOCOLATE LAB "ROO ROO RUFUS THE TANK" GRACIE WAS THE RUNT, BUT SHE WAS SOOOO CUTE! WE LOVED HER INSTANTLY AND BROUGHT HER HOME. HER GRANDMOTHER WAS A CHAMPION DIVER AND IT DID NOT TAKE LONG TO REALIZE GRACIE WAS LIKE HER GRANDMOTHER. SHE WILL JUMP STRAIGHT UP IN THE AIR 6 FEET. IT IS LIKE SHE HAS SPRINGS ON HER HIND LEGS! SHE IS SO FUNNY TO WATCH. 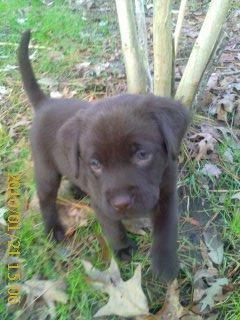 SHE IS JUST LIKE HER NAME SAYS "SWEET GRACIE BEA"
I have a little runt lab pup. She is doing well but is very lean. How old is your runt now? How is she doing?